Poll: Will Michael Frolik Be Traded By The Deadline? Frolik for his part was extremely professional when asked about the tweets today, indicating that he just wants to help Calgary win. Unfortunately, he hasn’t been given a big opportunity to do that this season. In the games he has played outside of his injury and scratches, Frolik is averaging just 11:54 of ice time. That’s easily the lowest mark of his career, and five minutes fewer than he averaged last season even as he struggled to produce offense. He finished with just 25 points in 70 games last year, but that number actually may go down this season. Incredibly, Frolik has just seven goals on the season and has yet to record a single assist. That from a player who has recorded at least 40 points in a season five times, and is carrying a $4.3MM cap hit through next season. That’s where it becomes tough for the Flames, who certainly don’t want that kind of money sitting the press box watching on a regular basis. Frolik is expected to get back into the lineup tonight against the San Jose Sharks, but moving forward it’s not clear if there is a real fit anymore. The Flames added two other high profile wingers in the offseason in Elias Lindholm and James Neal, and though the latter has certainly not found his groove yet—Neal has just seven points in 38 games—the team is committed after signing him to a five-year contract. Frolik meanwhile could free up some valuable cap space if he was moved, and likely still has some value even with his depressed point production this year. The 30-year old forward is versatile enough to play various roles in an offense, and obviously has shown the ability to contribute offensively in the past. Frolik does hold a 10-team no-trade clause, but with his agent publicly speaking out about the treatment he has received this year it may not be an issue at all for the Flames if they entertained offers. There’s no indication that GM Brad Treliving is doing that, but as the deadline approaches at the end of February the Flames are going to find themselves unable to add much for the playoffs if they don’t clear some cap space. Even past this year, the team is looking at a massive new contract for Matthew Tkachuk and a new deal for Sam Bennett without any substantial money coming off the books except Mike Smith’s $4.25MM cap hit. Still, it’s hard to say for sure if the Flames will move Frolik in-season. There’s something to say for having experienced options ready to step into a larger role if someone is injured, and Calgary doesn’t want to jeopardize the good position they have put themselves in halfway through the year. The team sits in first place in the Pacific Division, but have several teams breathing down their necks to dethrone them at a moment’s notice. So do you think they will move him before the deadline? Should they even be considering it? Cast your vote below, and explain your thoughts in the comment section. Saturday is an extremely busy day on the NHL calendar as there are the maximum 15 games on the slate with only Columbus getting the day off. With that in mind, there is bound to be a lot of roster movement. We’ll keep tabs of those moves here. With winger Alex Chiasson headed for injured reserve, the Oilers announced the recall of winger Kailer Yamamoto from AHL Bakersfield. The 20-year-old has had some success in his first stint in the minors, collecting four goals and four assists in 11 games since being sent down last month. Meanwhile, the loss of Chiasson certainly stings as his 16 goals place him third on the team in that department behind only Connor McDavid and Leon Draisaitl. The Stars have brought back winger Roope Hintz per a team release. The rookie has split the season between Dallas and Texas of the AHL and has had a fair bit of success offensively in the minors, posting 19 points in 17 games. He has held his own in the NHL as well, logging 11:41 per night in 14 contests while picking up a pair of goals and an assist. The Sabres announced the recall of goaltender Scott Wedgewood from AHL Rochester. He’s taking the place of goalie Linus Ullmark who missed practice on Friday due to illness. Wedgewood does have some NHL experience under his belt after playing 20 games with Arizona last year and four with New Jersey before that but Buffalo will likely call on Carter Hutton to play in Ullmark’s absence. Maple Leafs goalie Frederik Andersen is day-to-day with a groin injury. Accordingly, Toronto announced the recall of goalie Kasimir Kaskisuo on an emergency basis from the AHLs Marlies. The 25-year-old has struggled this season, posting a 4.12 GAA with a .866 SV% in 11 games thus far. Two weeks ago, the Lightning weren’t planning to send defenseman Slater Koekkoek on a conditioning stint. They’ve had a change of heart as he has now been loaned to AHL Syracuse. The 24-year-old last played on November 19th and has been a healthy scratch since then. Koekkoek’s conditioning stint can last for up to two weeks. Following the injury to Thomas Chabot on Friday, the Senators announced (Twitter link) that they’ve recalled defensemen Stefan Elliott and Christian Wolanin from AHL Belleville. Ottawa had two vacant roster spots so no corresponding move needs to be made. Elliott was acquired from Pittsburgh earlier this month and has already played in two games with the Sens but has spent most of the year at the minor league level. Meanwhile, Wolanin has been quite productive in the minors with 18 points in 26 games while getting into one game with Ottawa back in late October. The Senators have also recalled forward Jack Rodewald, although it is unclear if he will play tonight. Rodewald has been a frequent call-up this season, but to this point has played in just one game for Ottawa. The Islanders announced (via Twitter) that winger Michael Dal Colle has been recalled from Bridgeport of the AHL. He takes the place of winger Jordan Eberle who was placed on IR retroactive to December 23rd. The 22-year-old didn’t fare too well in his first NHL stint but he has been quite productive with the Sound Tigers, averaging a point per game over 28 appearances. 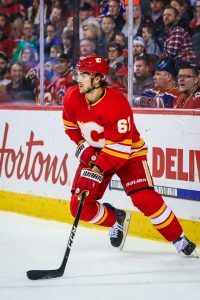 Dillon Dube is on his way back up to Calgary, as the Flames have recalled the impressive first-year pro from the AHL’s Stockton Heat. Dube began the season with the Flames, recording five points in 20 games, but since a late-November reassignment to the Heat, Dube has been a point-per-game player in the minors. Dube is expected to slot into the starting lineup right away tonight, taking the place of Michael Frolik. The Minnesota Wild have recalled free agent addition Matt Bartkowski for the first time this season, as the veteran defenseman will finally get back to the highest level. Bartkowski has made double-digit NHL appearances in each of the past six seasons, including an 80-game effort with the Vancouver Canucks in 2015-16. However, Bartkowski was very much a part-time player for the Calgary Flames the past two years and has even struggled to make much of a difference for the AHL’s Iowa Wild this season. However, with Nick Seeler presently sidelined, Minnesota opted to go with the experienced 30-year-old rather than one of their younger defensive options. The Arizona Coyotes have assigned forward Michael Bunting to the Tuscon Roadrunners of the AHL, according to AZ Sports’ Matt Layman. Bunting was recalled on Thursday and played against Los Angeles, playing 9:36 on the ice, registering only one hit. He will return to Tucscon where he has six goals and 18 points in 20 games there. Bunting was expendable with the return of Vinnie Hinostroza. The Vancouver Canucks have assigned forward Adam Gaudette to the Utica Comets of the AHL, according to Sportsnet’s Rick Dhaliwal. Gaudette was recalled on Oct. 15 due to injuries and managed to stay with the team even when those players returned in a bottom-line role. The 2018 Hobey Baker award winner was averaging just 10:09 of ATOI this season and had just two goals and six points. A return to the AHL where he can get more significant ice time would be better for the young forward in his development. The Anaheim Ducks announced they have swapped out defenseman, recalling defenseman Andy Welinski from the San Diego Gulls of the AHL, while assigning Andrej Sustr there at the same time. Welinski last played for the Ducks in November where he played 11 games for Anaheim, posting one assist, while averaging 15:09 of ATOI. Sustr has only appeared in five games for the Ducks this season. CapFriendly adds that the Ducks also returned goaltender Kevin Boyle to San Diego. He was recalled Friday to fill in as an emergency backup while John Gibson and Ryan Miller dealt with injuries. His demotion suggests that one of them is ready to return to the active roster. The Flames announced that they have activated winger Michael Frolik off injured reserve and he will be back in the lineup today against St. Louis. The veteran has missed the last 15 games due to a high ankle sprain. He has been more productive in the goal scoring department this season with seven tallies in 20 games, a far better pace than last year where he had just ten in 70 contests. However, his ice time has been slashed considerably as he’s logging just over 12 minutes a night as his role in the lineup has been reduced. The team also announced that winger Ryan Lomberg has been assigned back to Stockton of the AHL. Still with Calgary, it has been a weird couple of weeks for Flames prospect D’Artagnan Joly. He left Baie-Comeau on December 12th to await a trade and one week later, that move came as he was sent to Victoriaville. However, he’s on the move once again as the Rimouski Oceanic announced that they’ve now acquired him from the Tigres in exchange for a 2020 first round pick and a prospect. The winger was Calgary’s sixth round pick (177th overall) in 2017 and has to sign by the beginning of June or the Flames will lose his rights. Joly is off to an okay start this season with 26 points in 31 games (but below his point-per-game average of 1.24 last year) but will need to pick it up down the stretch if he wants to earn a contract. Stars center Martin Hanzal will miss tonight’s game due to a sore back, notes Mark Stepneski of Stars Inside Edge (Twitter link). Even though he’s expected to suit up tomorrow, this has to be cause for concern considering he just came back to the lineup earlier this month after undergoing spinal fusion surgery on his back in March. The veteran is off to a slow start offensively with just two points in six games but has been particularly sharp at the faceoff dot, winning over 61% of his draws. Jason Spezza (illness) will take Hanzal’s spot in the Dallas lineup. Last season brought incredibly bad luck in regards to injury for the Tampa Bay Lightning. Steven Stamkos played just 17 games before going down for the rest of the season, and they even lost three different centers all in a single game late in the year. 2017-18 has been much different, until a few weeks ago when Victor Hedman was ruled out for three to six weeks with a knee injury. The team obviously suffered without their Norris Trophy candidate, but that won’t last long. Hedman took a full morning skate with the team and is a game-time decision for the Lightning tonight. The injury occurred on January 11th, less than three weeks ago. Michael Frolik has been activated from injured reserve in Calgary, and is expected to play tonight. Frolik hasn’t played in over a month after taking a puck to the face against the San Jose Sharks, and will look to get back on track right away against the Vegas Golden Knights. The 29-year old winger has just 15 points on the season, but is a huge part of the Flames even-strength attack and one of their best penalty killing forwards. The illness that kept Seth Jones from appearing in the All-Star game won’t keep him out of any regular season action, and Bruce Boudreau isn’t happy about it. The head coach of the Minnesota Wild called it “ridiculous” that Jones would be allowed to play without serving the normal one-game suspension for avoiding the All-Star festivities at the last minute, but according to Michael Russo of The Athletic (subscription required) the decision was made by the league in order to prevent any outbreak of the flu among the best players in the game. Jones had wanted to play, and now won’t be punished for his absence. 1:35: Postmedia’s Kristen Odlund tweets that the prognosis for Frolik is he will be out four to six weeks. 12:29: The Calgary Flames already knew it was coming when winger Michael Frolik suffered a fractured jaw while trying to block a shot by San Jose’s Brent Burns in Thursday’s game. However, Sportsnet’s John Shannon tweets the team finally placed the 29-year-old on injured reserve today after he underwent surgery Saturday night to repair his broken jaw. While no timetable has been discussed, Frolik is expected to miss multiple weeks as he recovers from the surgery. His offense had been down a bit this season as he has just seven goals and eight assists through 37 games, but has been playing on the team’s second line most of the season. He had 17 goals and 44 points last season. The team did recall their AHL’s top scorer as the team promoted Andrew Mangiapane Sunday to replace Frolik. A former sixth-round pick in 2015, the 21-year-old has thrived in the AHL in two seasons, and currently leads the Stockton Heat with 14 goals and 19 assists, which is on pace for a bigger season than his 20-goal output with Stockton last year. Mangiapane is expected to be inserted into the Flames lineup immediately and is expected to play on the team’s fourth line in tonight’s matchup against Chicago. While the most notable injury concern for Chicago is and will continue to be goaltender Corey Crawford, the struggling Blackhawks made other health-related transactions today. The team announced that defenseman Cody Franson, out since early December with an upper-body injury, has been activated and, in a corresponding move, forward Artem Anisimov has been placed on injured reserve with an upper-body issue of his own. While Franson will be a welcome addition to the blue line, the long-term loss of Anisimov will be felt much more. The Blackhawks have struggled on offense this season; they are a middling team in goal-scoring and one of the league’s worst power play producers. Forward depth, particularly down the middle, has been a cause for concern and that was prior to Anisimov’s absence. Although ten points behind the Nashville Predators in the Central Division, Chicago is not that far out from the Western playoff picture. However, that could change if the extended sidelining of Anisimov leads to even greater issues on offense on top of the already serious situation in net. Although severely strapped for cap space, the Blackhawks are certainly looking around for ways to bring some depth into the fold. One option that can be cast aside for now is veteran Arizona Coyotes winger Brad Richardson. CapFriendly reports that Richardson has been placed on injured reserve after he was forced out of the ’Yotes game against the Colorado Avalanche last Saturday with an upper-body injury. As the worst team in the NHL currently, Arizona is surely welcoming offers for their impending unrestricted free agents (and then some). It’s not a long list of soon-to-be-departing players, but the useful, two-way forward Richardson is at the top. His injury history could definitely scare away some suitors though and the Coyotes may have a tough time moving him until he has returned to full strength following his stay on IR. There’s finally an update on the condition of Michael Frolik after the dependable forward took a shot to the face early in Calgary’s game against the San Jose Sharks on Thursday, but it’s not what Flames fans were hoping to hear. Frolik left the game and did not return and, as it turns out, the shot fractured his jaw and knocked out several teeth. While he has yet to be formally placed on the injured reserve, head coach Glen Gulutzan opined that Frolik was “week-to-week” with no time table for a return. Frolik’s absence will have major repercussions on the lineup, not only due to the underrated winger’s ability, but also the team’s dire lack of right wingers. The forward lines are set to undergo major changes until Frolik is healthy enough to return to action.